Pope Francis chats with six astronauts at the International Space Station. Pope Francis chatted with six astronauts at the International Space Station (ISS) on Thursday, kicking off the rare interview with a philosophical question on "man's place in the universe". Italian astronaut Paolo Nespoli, 60, admitted that despite the bird's eye view of Earth he too remained "perplexed", while American Mark Vande Hei said seeing the planet from space made them "realise how fragile we are". 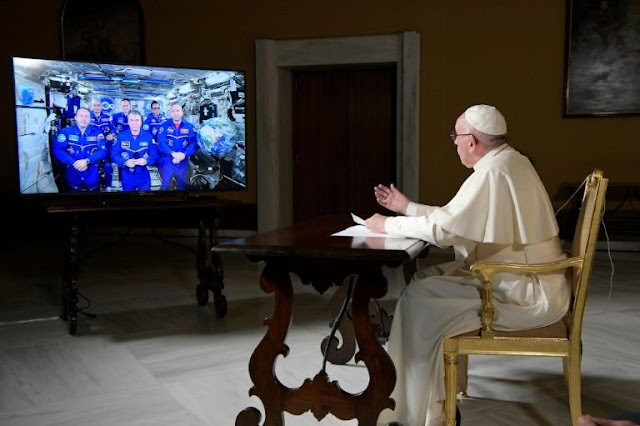 The Argentine pontiff sat at a small desk inside the tiny city state, facing a wide-screen television on which the astronauts from America, Russia and Italy could be seen floating together in their blue suits. "Good afternoon... or good evening. I imagine time passes differently at the space station, right?" the pope quipped. "Astronomy makes us think about the universe's boundless horizons, and prompts questions such as 'where do we come from, where are we going?'" the pope mused. A 30-second delay in the satellite feed gave Nespoli, Vande Hei, Americans Randolph Bresnik and Joseph Acaba, and Russians Sergej Nikolaevic Rjazanskij and Alexandr Misirkin time to weigh up life's biggest questions. "Our aim here is to spread knowledge, (but) the more we learn, the more we realise we do not know," Nespoli admitted. "I would like people like you, theologians, philosophers, poets, writers, to come to space to explore what it means to be a human in space," he said, as Francis nodded and smiled. But the pope had not finished: what, he wanted to know, was their opinion of love as a force that moves the universe? What was their source of joy up in the space station, and how did a life without gravity change their view of the world? The crew took it in turns to get their philosophical caps on, and not even a technical hitch which temporarily interrupted the interview, or the lack of a Russian translator, could throw the space travellers off course. Pope Francis chatted with six astronauts at the International Space Station (ISS) on Thursday, kicking off the rare interview with a philosophical question on "man's place in the universe". Italian astronaut Paolo Nespoli, 60, admitted that despite the bird's eye view of Earth he too remained "perplexed", while American Mark Vande Hei said seeing the planet from space made them "realise how fragile we are".